An exciting week is over now. Indeed, we attended INTERMOT in Cologne with our team, where we attracted numerous visitors to our well-positioned and beautiful stand. As the Cologne fair grounds are huge, we also positioned our Kumpan scooters in four additional locations where no visitor could miss them. Every two years, we present our new products and our current concepts related to the Kumpan e-scooters at INTERMOT. This year's focus was our new 1954Ri (Retro intelligence) model. This new e-scooter takes digitization to the road, thus representing a revolution in the scooter segment. In addition to presenting our new products, we had many interesting talks with Kumpan retailers, journalists, and consumers. We also used INTERMOT to get in touch with new retailers and importers and to raise awareness of the Kumpan electric brand. Our entire team did a great job and is now a little tired, but we are truly satisfied with the trade fair's results. Dagmar, a visitor to our stand from Cologne, was lucky enough to win a Kumpan e-scooter. Together with our partner KölnMesse, we raffled off the scooter during INTERMOT. Finally, we would like to thank all Companists who visited us at INTERMOT. Below, we are providing you with some information on the main aspects of this year's INTERMOT. An innovative telemetry module inside each battery enables communication with the rider. Through our self-developed smartphone app, riders can also control their Kumpan's different features. This app enables configuration of the e-scooter to suit everyone's personal requirements. From now on, Kumpan riders can decide themselves how to use their scooter's battery power by choosing between the eco, standard, and sport mode in combination with an energy recovery feature. In addition to the smartphone app, users can also use the newly developed LED touch screen speedometer to control the above features. Apart from the current speed, the battery charge, and various features, the LED display now also informs riders about the required service and maintenance intervals. Kumpan riders going to unknown areas of a city can use the new navigation system. Innovative technology is one thing, but unique Kumpan retro design is something entirely different. While developing the new Kumpan 1954Ri, we also made some changes to its design. Indeed, the latest Kumpan scooter includes a curved sideline, innovative LED lights, exchangeable handles, extraordinary seat cushions, and high-quality materials. To help people take important things with them while riding their Kumpan, we have revised its storage-space concept. Apart from a larger storage compartment below the seat, our new Kumpan has a lockable glove box and a storage compartment inside the foot plate with an integrated can/bottle holder. When riders park the scooter, they can lock it through an electric lock system. If that is not sufficient, riders can also active the electronic immobilizer using the smartphone app at any time. This immobilizer is always connected to the rider through the telemetry module. In addition to our new model, we also presented our innovative solutions for various business models. The new Kumpan Kraftpaket 2.0 battery enables various areas of application for our 1953 and 1954L e-scooter models and for the upcoming 1954Ri. In fact, this new technology enables numerous business models, ranging from fleet management and scooter sharing to delivery and courier services. Our Kraftpaket 2.0 is an innovative battery concept developed in Remagen. The new technology makes riding a Kumpan scooter easier, more convenient, and more flexible than ever before. Through GPS-powered technology, users will be able to retrieve vehicle data, control features of the Kumpan scooter, and run complex error analyses in the future. Consequently, not just the scooter itself possesses an interface to the outside world, but also the battery – the heart of every electric vehicle. Moreover, Kumpan presented its delivery scooters made specifically for the delivery and courier service industry at this year's INTERMOT. Because our scooters can be adapted to each client's individual needs, they are the perfect fleet members. Indeed, no matter whether a thermobox, a transport box, or a trailer is required, Kumpan scooters meet almost any requirement. 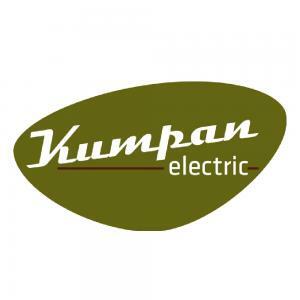 Because of our scooters' easy handling and innovative battery concept and our eco-friendly and cost-conscious logistics, Kumpan electric offers the perfect solution for all modern fleets. Now let's shape the roads of tomorrow together! Please invite your friends, acquaintances, and business partners to join the Kumpan family as well. Follow us on social networks like Facebook, Instagram, YouTube, and Twitter and experience the electrical revolution yourself.